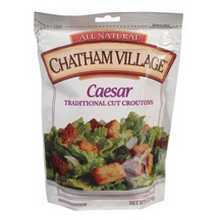 Save on Chatham Village Caesar Croutons (12x5 OZ). Wheat flour, canola and/or sunflower oil, whole wheat flour, rye flour, dehydrated garlic, salt, yeast, caramel color, caraway seeds, natural flavor, water. This decriptions is informational only. Please review the actual product for ingredients and suggested serving prior to use.